The animal we use to wash our cars. Sponges belong to the phylum Porifera and evolved nearly 700 million years ago. Porifera are pore-bearing multicellular animals which are typically marine, who feed through filtering food out of the water through their pores. There are nearly 5,000 living sponge species who are classified under this phylum. What makes these organisms so interesting is their ability to retain water once taken out of it. This characteristic was noticed and utilized by humans as far back as 800 B.C.E. by the ancient Greek author, Homer, in one of his poems, stating how the god Hephaestus cleaned his hands, face, and chest with a sponge. The sponge has also been referenced in the writings of Plato and Aristotle. This highlights the importance and history of these organisms and their relationship with us. Synthetic sponges are different entirely, only similar to natural sponges in their absorption ability. These are made in a lab, not grown in the ocean. Synthetic sponges were created in the 1940s by the DuPont Company, a leader in synthetic material production at the time. They sold the patent for synthetic sponges in 1952 to General Mills, and since then, have almost completely replaced natural sponges in everyday household use. Synthetic sponges are composed mainly of three materials; cellulose derived from wood pulp, sodium sulphate, and hemp fiber. Sponges are incredibly useful and important tools. Natural sponges are important for their ecosystems, offering housing and protection for many forms of sea life. They were also used prior to the mid-1900s for cleaning, as synthetic sponges are used now. Natural and synthetic sponges are very similar in their purpose and appearance, but different in almost every other way. Most of these differences highlight how the synthetic alternative isn’t all it’s cracked up to be, and perhaps should take the backseat to natural sponges in everyday household and personal use. Natural sponges can do everything a synthetic sponge can do, except better, more efficiently, and with less environmental cost. Synthetic sponges are injected with a chemical called triclosan, something which is considered a pesticide and used to fight bacteria from growing. This chemical has been linked to skin rashes and cancer, however, its direct cause of these ailments has yet to be confirmed. To keep in mind though is the waste and the harmful toxins that are emitted back into the environment during the process of creating synthetic sponges. Meanwhile, natural sponges contain an enzyme that helps prevent the development of odors, molds, and bacteria; an enzyme that isn’t harmful to humans. They are also also hypoallergenic since they don’t contain any artificial ingredient, harsh chemical, or toxin. Another benefit to natural sponges is that the ones used by humans are naturally soft, absorbent, and don’t irritate skin upon application. Natural sponges last longer than synthetic sponges, are fully biodegradable, and are sustainably harvested so that they remain a renewable resource; being grown at the same rate they are harvested. This leads one to wonder why we still use synthetic sponges opposed to natural sponges. 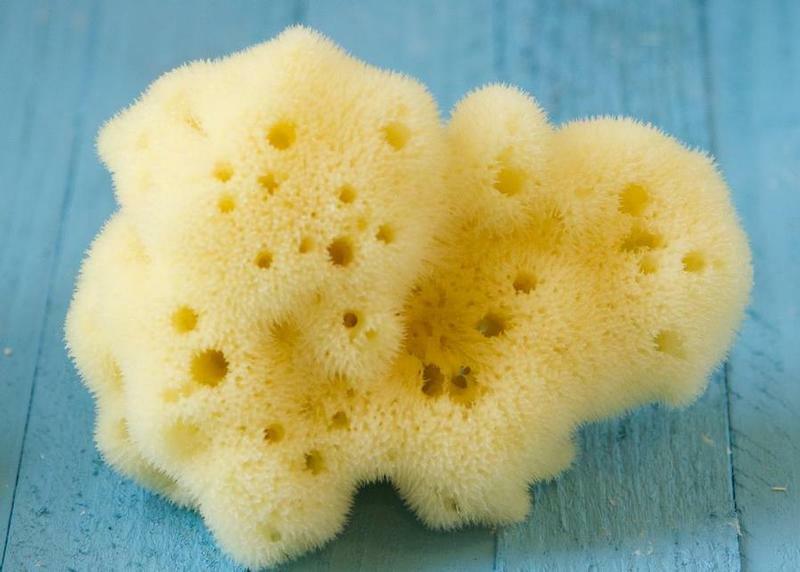 Perhaps a reason most still use synthetic sponges is due to their availability, the of the public with a lack of knowledge on the benefits of natural sponges, as well as natural sponges seeming to be less appealing due to them being living organisms. Synthetic sponge production contributes pollution to our world while natural sponges don’t. 99% of households that use sponges use synthetic sponges and most likely don’t even realize how natural sponges are better. This issue is almost irrelevant given everything going on in the world, but more awareness on this subject would be great and beneficial to the world if less people used synthetic sponges.